Very few things bring me back to a time and place like food does. I’ve never felt that as much as I do now that I no longer live in my native Connecticut. When most people think of New England foods they probably think of clambakes, Maine lobster, and clam chowder. While those foods are very New England and are near and dear to my heart, they can also be easily found anywhere in the United States. However, there are a few lesser known foods that can only be found in New England. New Haven pizza, steamer clams, and grinder sandwiches to name a few. While they are very similar, I recently called the sub the grinder’s underachieving cousin and I stand by that. We haven’t been able to find a sandwich in Colorado that even comes close to the grinders that we grew up with so we have tried our hand at making them at home instead. This, my friends, is how to make a grinder. The one thing that makes or breaks a grinder is the bread. Finally, I found rolls that looked and felt very much like grinder rolls on a recent shopping trip to Safeway. Could it really be? For the first time in the three years that I’ve been away from New England, I had as close to a classic grinder as I think I’m going to get away from home! A grinder roll closely resembles Italian bread, but the inside is chewier and the outside has a nice crust on it. Finding the perfect bread is a must then the rest of the sandwich will fall into place. Slice the roll so that it’s open but not all the way; you want all of the ingredients to stay in the sandwich instead of all over your lap. Liberally coat the bread with oil, then add a light sprinkle of oregano. Some people like mayo instead, but I prefer extra-virgin olive oil. While shopping at Safeway, I noticed that there was a $0.75 off digital coupon available for Hillshire Farm® Naturals deli meats. I was excited to see that it’s minimally processed and free of artificial ingredients and nitrates so I bought some ham and turkey to use for my grinders along with some Provolone cheese. Not only did I have a coupon which was a great incentive on its own, Hillshire Farm® is offering a “Love It or We’ll Eat It” Guarantee for those who try the product. They will donate a lunch to someone in need if you “Love it” or provide a rebate. Now it’s time for the lettuce and tomato. One of the important parts of a true grinder is to shred the lettuce. I use romaine lettuce, but you could use iceberg if you prefer. If using romaine cut off the dark green leafy top and set it aside for a salad and thinly slice the lighter, more crisp lettuce closest to the core. Once you’ve added your lettuce and tomato, drizzle the top with more extra-virgin olive oil and red wine vinegar, then sprinkle more oregano, salt, and course ground pepper. 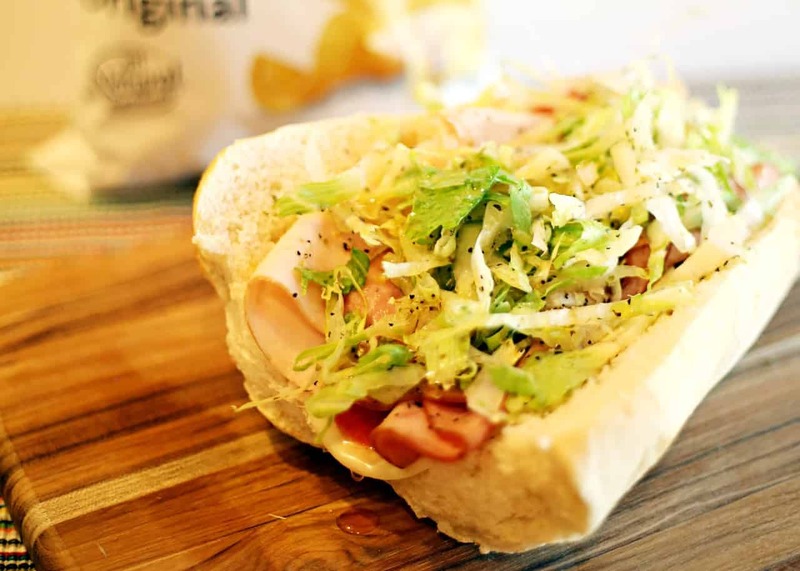 There you have it: a classic New England grinder. Similar to a sub, but this Connecticut native insists that there is really no comparison. What food most makes you think of home? being a fellow Connecticut Yankee, I don’t remember the meat being ham or turkey. It was always Genoa salami and/or prosciutto meats in a Grinder. Maybe different parts of the state have different ideas of what a grinder is. I was born and raised in the Mystic/Stonington area and we always referred to all subs, regardless of the kind, as grinders. It doesn’t matter if it’s genoa, ham, or even tuna – they’re all grinders if they’re on a long roll. You’re spot on Regan. Heading down to Groton Long Point for July and can’t wait. One added clarification, you must slice tomatoes and onions paper thin – meat is laid out flat to hold lettuce and tomatoes as well as catch extra olive oil. Nice! My family is from Groton Long Point, Noank, Stonington, and Mystic. Enjoy and have a proper grinder for me. I’m originally from New London and grew up in the old Italian neighborhood near Shaw St. where the grinder was born. Your right the bread makes it or breaks it, plus the extra virgin olive oil and the fresh coarse ground pepper. The red wine vinegar came later and still prefer my grinder without it. I now live in Florida and found the chain Jersey”s Mike to be very close to the old grinder of New London. Nice to “meet” you! I was born in New London and grew up in Stonington and Mystic. We have Jersey Mike’s here in CO and I agree that they’re pretty good. It’s the closest we’ve found outside of CT. I was born in New London, raised in Montville and now reside in Niantic and I agree, grinders are quintessential to this area. Since I came across this post I’m now in the mood for one so I’ll be heading out to pick up a genoa grinder for dinner tonight. I grew up in Stonington & Mystic and Southeastern CT definitely has the best grinders! I then lived in the New Haven area for ten years and never found one as good as I had in SE CT. Now we’re in Central Mass and I’m still looking for a really good grinder (and pizza). I don’t know what they do down there, but it’s almost magical.